Yefimov Serif is a typeface created by Alexandra Korolkova together with Maria Selezeneva & Vladimir Yefimov and published by ParaType that comes in low contrast, squarish shapes of round glyphs and more. It was designed to be useful for display, magazine, newspaper, text but also for periodicals, corporate identity etc. 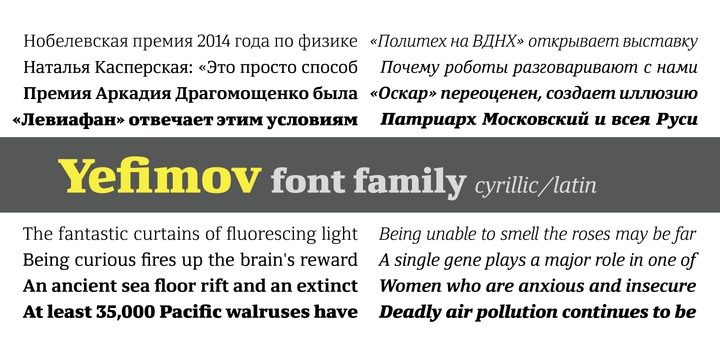 A font description published on Monday, January 5th, 2015 in Alexandra Korolkova, Fonts, Maria Selezeneva, ParaType, Vladimir Yefimov by Alexandra that has 3,526 views.